Giovanni Bassanesi (Aosta 1905- Montelupo Fiorentino 1947) was an Italian anti-fascist. On July 11, 1930, at 10:30, he left Bellinzona, passing by Lodrino (Valle Leventina), in order to jettison over 150'000 anti-fascism propaganda flyers over the Fascist city of Milan. 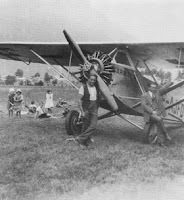 The Farman F.200, used for this exploit, was a civil utility aircraft produced in France in the 1930s. It was a parasol-wing monoplane with open cockpits in tandem for the pilot and one or two passengers. Intended, primarily as a trainer, it was also marketed as being suitable as a photographic platform or a mail plane. In June 1930, the airplane Farman F.200 F-AJFD was purchased by Gaston Brabant, a captain of the French army and a managing director of the magazine "L'Avion". On July 5, 1930, Brabant and Bassanesi left Toussus-le-Noble, near Paris, in order to participate to the flying Rallye d'Auvergne. They continued the trip to Geneva via Lyon-Bron. On July 9, Bassanesi and Brabant left Geneva for the airfield in Bellinzona; at this point, Bassanesi was already sole owner of the airplane. 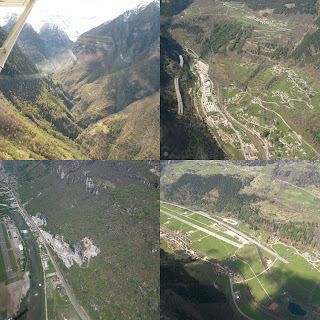 The airfield in Bellinzona was located near the military training zone; nowadays it is disappeared: the airfield would be situated between the public swimming pool and Via Francesco Chiesa, alongside the Ticino river (presumed location of the airfield in Bellinzona). The airplane landed on Thursday, July 10, in Bellinzona. In order to conceal the operation, Bassanesi decided to load the flyers not in Bellinzona but in Lodrino, about 10 minutes flight from Bellinzona toward the North. The next morning, on July 11, Bassanesi landed in the field in Lodrino (valle Leventina), close to the former military airfield, built ten years later during 1941-1943, only to refuel. Bassanesi managed with the help of the local people to take-off from Lodrino. The airplane F-AJFD with a co-pilot, flew to Milan, where Bassanesi jettisoned 150’000 flyers of anti-fascist propaganda over the city. Bassanesi managed to land again in Lodrino, at 13:30, without consequences. He lost much time in the afternoon by refuelling and changing the oil. Despite weather conditions worsening around the Alps, Bassanesi left for Zürich the same day at 17:00. He crashed the airplane for causes of the bad weather near the Hospice of the Gotthard Pass at Monte Prosa, few hours later at 18:30. He was badly wounding in the crash. Imprisoned by the Swiss authorities, Bassanesi was condemned, in Lugano, for four months of prison. Later, he was expelled to France. He died after the war. The airfield in Lodrino exposes a DeHavilland Venom DH-112 with marking J-1580. Nearby, on the western side of the airfield, there is a monument to Giovanni Bassanesi.